Easton is the little brother to Camden, who has cerebral palsy. 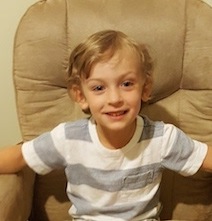 He is a energetic 4 year old who loves to play with his brother, and also bug him (like any other sibling). Playing! Easton loves playing trains, cars, legos, and play-doh. He loves being outside & riding his tricycle or playing baseball. Clothing, Shoes, bedsheets, Pj’s. Fuzzy socks or slippers. Winter hat & gloves. Thomas train trackmaster Thomas adventures! toys (these are fairly new. I know they can be found at Target. They operate on plastic tracks. He is obsessed with them. ) Hot wheels cars & tracks, toys for outside play, Imaginext batman toys, spiderman toys, Cars toys, bath toys, age-appropriate puzzles, rainboots & raincoat. Help with gas and groceries is always appreciated.